Beach; Chemanius to Lulu Island; and an east/west Cameron Lake crossing. This award adds to Simplex' ex- isting world-record workload of 13,670 miles of fiberoptic cable. Laboratories, Inc., a worldwide manufacturer of fire protection/flow control systems, electrical and elec- tronic components, and packaging materials. Bath Iron Works (BIW), of Maine has announced the naming of W.
Winfield Price III, as vice presi- dent of business development. Mr.
Samuel B. Roberts, which was dam- aged by a mine in the Persian Gulf, and as a deputy program manager for Aegis Cruisers. " 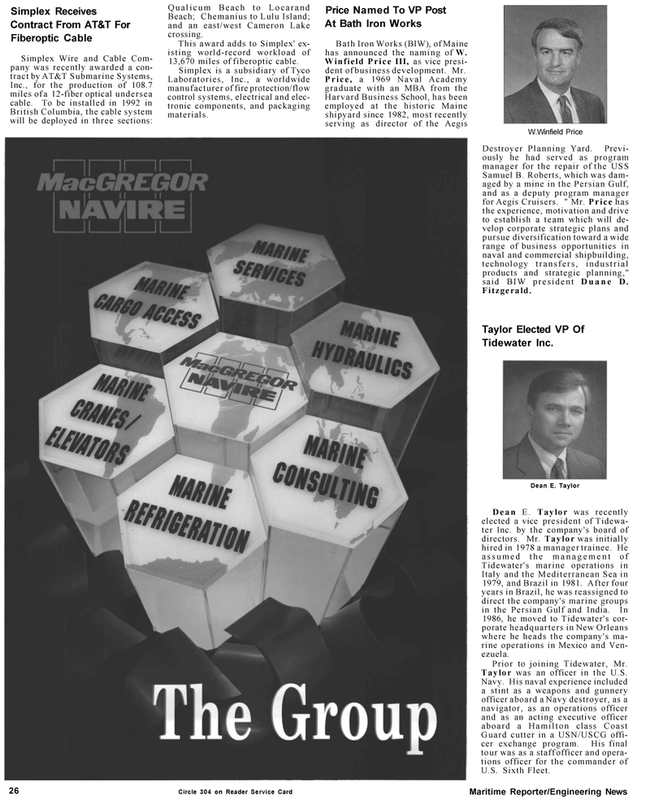 Mr. Price has the experience, motivation and drive to establish a team which will de- velop corporate strategic plans and pursue diversification toward a wide range of business opportunities in naval and commercial shipbuilding, technology transfers, industrial products and strategic planning," said BIW president Duane D.
Italy and the Mediterranean Sea in 1979, and Brazil in 1981. After four years in Brazil, he was reassigned to direct the company's marine groups in the Persian Gulf and India. In 1986, he moved to Tidewater's cor- porate headquarters in New Orleans where he heads the company's ma- rine operations in Mexico and Ven- ezuela. Prior to joining Tidewater, Mr.
Taylor was an officer in the U.S.